edge. Dunedin is a quaint small town with unique shops and restaurants and within walking distance (10-15 minutes) from the condo. The condo has a terrific layout; the master bedroom and bath is on one side of the unit with the second bedroom and second bath on the opposite side. Brian and I are originally from Michigan. We spent many years finding the perfect property for our second home. We wanted a place to get out of the cold. When we found the Victoria Condos and Dunedin we fell in love. A few years after we purchased the condo, my husband was transferred to California for work. Needless to say we don't get to Florida as much as we used to, but we intend to come back to the area one day. My husband and I love anything outdoors. This property is in the middle of everything. We can walk out the front door to the pool/water. There is shopping and restaurants in town which is a 10-15 minute walk. The Marina is also walking distance. There is a walking/biking boardwalk that winds around St. Joseph Sound. It is all so gorgeous. Also nearby are kayak rentals, golfing and Honeymoon Island. We love that you can walk outside the front door, be outside in the warm fresh air and be within 40 steps of the water. The courtyard is so lush and peaceful. 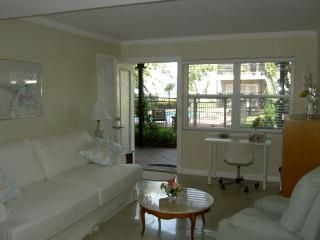 Many of our guests return the same time every year because they also fell in love with Victoria Condos and Dunedin. Carport for one car. Additional parking in complex available. No RVs. No motorcycles allowed. Available for rent in town. Pristine and Quiet gated community (only 24 units) on the Gulf of Mexico. 2 Bedrooms and 2 full baths. First Floor Unit (no stairs). Walk out the front door and only 40 steps to the water (St. Joseph Sound). Open floor plan including many windows, ceiling fans, Terrazo floors and graite counters. Master Bedroom has King size bed and private master bath. Outdoor pool, garden-like courtyard, excercise room, picnic area with outdoor grill at water's edge. Washer and dryer inside unit. Central Air. Internet provided (not wireless). Lovely walk down Historic Victoria Drive to downtown Dunedin. Great location, terrific neighbors! Would be back in a heartbeat! What makes this condo so special is it's " New Orleans Style"
courtyard charm,the historical area, the old growth oaks, beautiful planters, and the amazing birds. I wore my guide out looking them up. Osprey, herons, wading birds. I know its florida and florida has alot of birds.....but to observe them so close in such a populated area is pretty cool. Mom and I named them...they were our buddies. We also loved having our morning coffee and having 3 islands within our vision and everyone comes out right before sunset to see the beautiful colors over Caladesi. The condo was very quiet and very comfortable. The full time residents were very kind and the pool was wonderful after island exploring and biking. The owners were very helpful while making arrangments. We enjoyed this historical home walkway to town every morning. The condo was lovely. Only complaint was from the guest room where you could hear the water fountain all night. We had a plumbing problem in the guest bath where washer/dryer were also located. Owner rectified it right away. Owner very pleasant to deal with. Monthly Rate: $995 - $3600 * May $ 1995 per month * June - Oct $ 995 per month * Nov $1600 per month * Dec $1900 per month 2015 * Jan-March 2015 $ 3600 per month * April 2015 $ 2695 per month Plus: 12% Florida tax, $85 cleaning fee, $75application fee and $500 (refundable) security deposit.